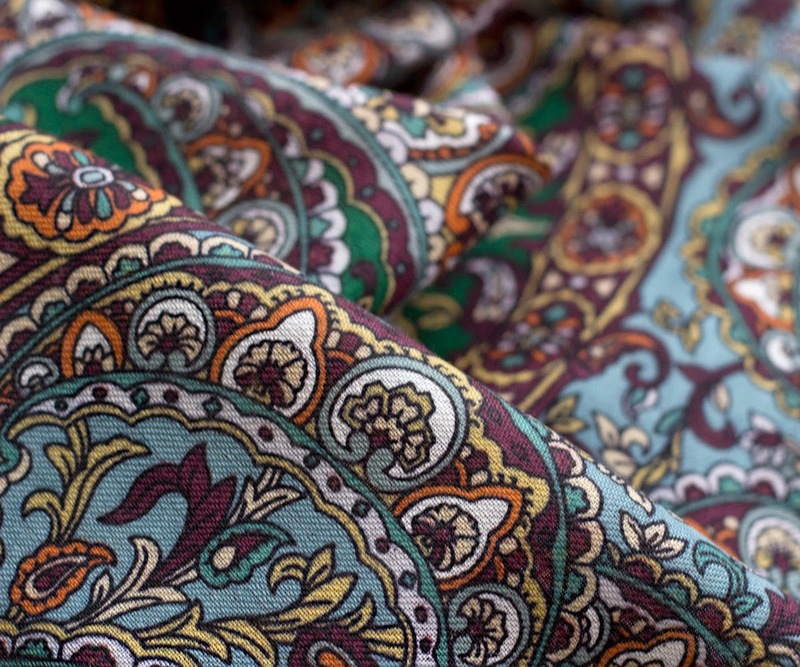 As a rule, when Russian shawl is mentioned, we imagine a black or, less often, a white wool shawl, full of abundant flowers and leaves, very bright - many people even think they are too bright to be worn in everyday life. This is my first association, too. Russian shawl? - winter, snow, sleds with horses, churches with golden domes, nesting dolls, samovar and bright flowers on black background. Oh, so banal, but also quite true. 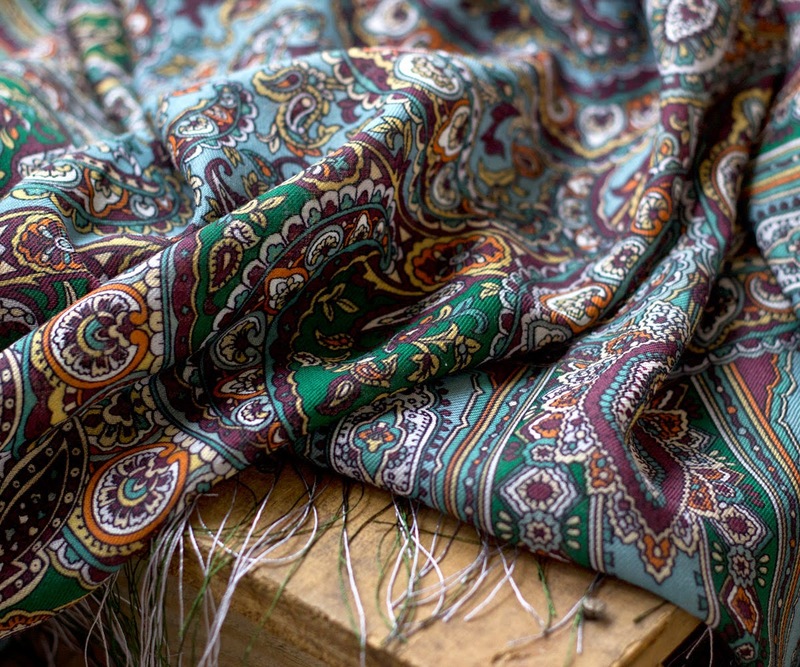 However, not all Russian shawls are black or white, just like life is not black or white. And not all of them are full of rich red or hot pink roses (again, like real life). For instance, this one is a very organic mix of blues, greens, browns and lots of small pieces of colors which jointly form a beautiful peaceful picture. A very unusual and beautiful accessory, it is one of my favorites. 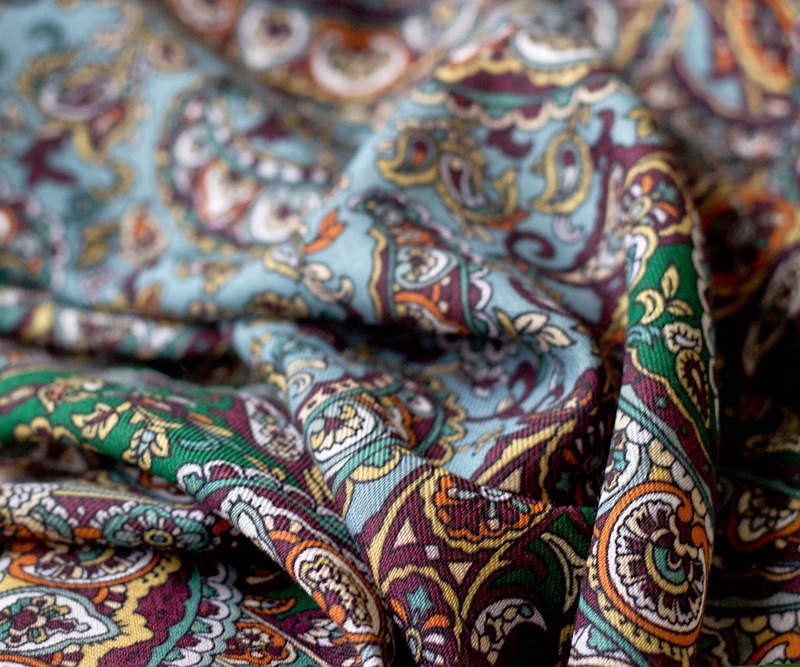 It was designed by Elena Jukova for the Pavlovo Posad Manufacture, the oldest and most famous Russian shawl production factory. This shawl is called Sadko, after the main character of a Russian medieval epic story. It is made to resemble sea waves, in accordance to the plot where the Sea King plays a very important role. In the legend, the Sea King (or Tsar, to make it more authentic) heard Sadko (a merchant) play his gusli (type of a smaller harp) and loved his music so much that he offered his help and protection. With the help of the Sea Tsar, Sadko won a fantastically difficult bet (he betted with other merchants that he would catch a specific fish in the lake, and succeeded, due to the Tsar's help), and became rich. Then there were several versions of the epic, but, according to the most, Sadko forgot to pay due respect to the Sea Tsar when travelling by the sea with his caravan of ships, there was a huge storm, and Sadko had to go into the depth of the sea to save other people. Then he made peace with the Tsar by playing beautiful music, and, finally, married his daughter (or, alternatively, went back to his human wife). In any case, the ending was good. In the tale, there were sea fairies, beautiful and powerful. I imagine that this shawl would be perfect for a sea fairy, should she fancy to turn human and have a walk at the sea side. 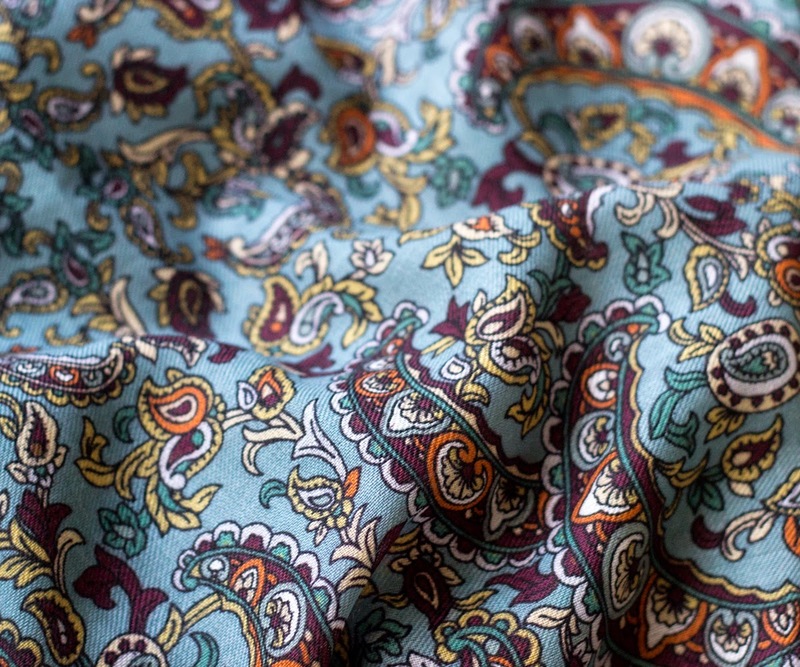 I like the quiet and rhythmic movement in the shawl's print, It does look very much like waves. I also love the fact that the waves are made from small flowers and branches. You can look into this shawl forever, like into the depth of the sea. This Russian shawl reminds me of this beautiful illustration to Pushkin's Tale of Tsar Saltan. 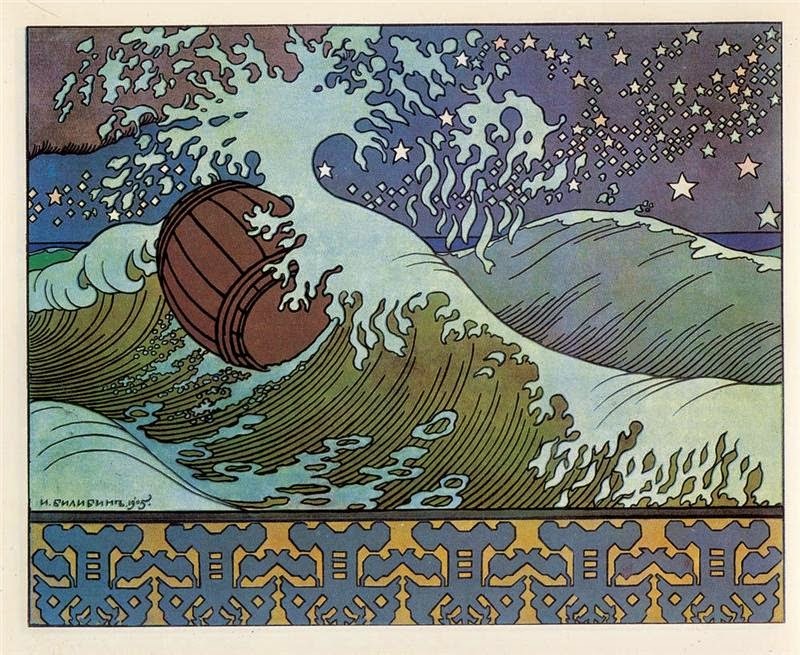 Of course the artist is well acquainted with Russian classics (and Pushkin also wrote a poem on Sadko), and may be partially her inspiration comes from the classic and famous illustrations by Ivan Bilibin. Several photos more, and I am done. I just love looking at this sea fairy shawl with its mingle of turquoise, emerald, gold and copper brown. 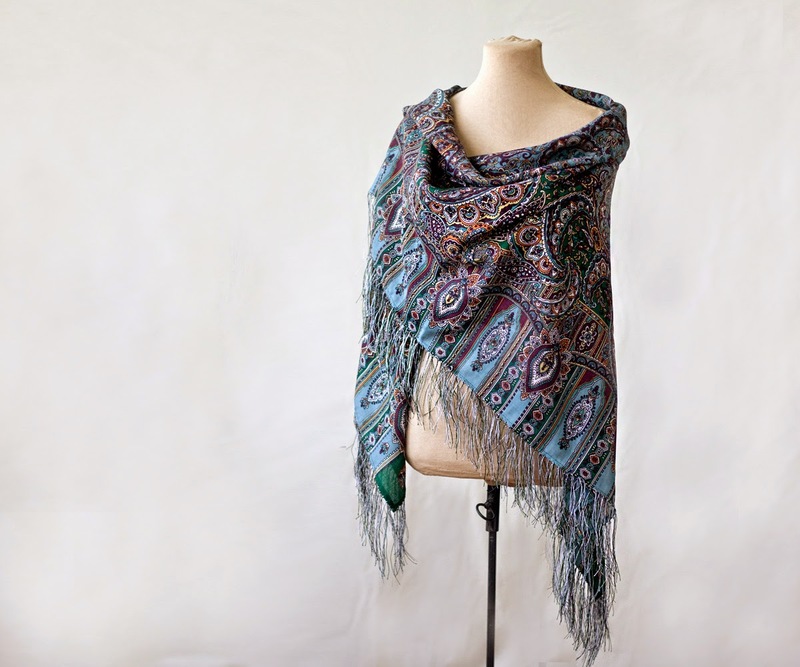 You can buy this lovely shawl at our Mulberry Whisper shop on Etsy. We also have many other Russian shawls for sale there, and we do our best to provide good descriptions and photos.